Q. What Diploma Courses are offered? A. There are two Diploma Courses - The Standard and Advanced. Q. What are the requirements for these courses and how long are they? A. For course duration and requirements, please see section PROGRAMS - COURSES & TRAINING. Q. What are the entrance requirements for these courses? A. For the Standard Diploma, a Bachelor’s Degree is preferred. Equivalent post-secondary education/experience may be considered. The prerequisite for the Advanced Diploma is completion of the Standard Diploma. For both courses, interest/experience in teaching children would be an asset. Q. What are the registration/tuition fees? A. There are no registration or tuition fees. However, participants are expected to cover, if necessary, the costs for their transportation, accommodation, meals, and some materials. Q. What kind of commitment must I have during the course? Are there additional classes such as practice teaching that is required after the course? A. Yes. More information is available in the section PROGRAMS - COURSES & TRAINING. Q. Will I receive credits for the courses I take from CISSE with other institutions? A. You will receive a certificate after the completion of each Course indicating the hours of instruction. Other educational institutions may give you credit for these courses at their discretion. We will be working towards accreditation from other educational institutions in due course. Q. Where can I observe a SSEHV program, either at a school or a community center? A. The program may be observed at the Sathya Sai School of Toronto. Please contact the Director of CISSE in advance to make arrangements. Contact the Director of CISSE for information on programs in community centers or at partnership schools. Q. Do I need to have a teaching certificate to teach SSEHV at a school or in the community? A. You must be certified to teach in a regular school. However, you may assist a qualified teacher with SSEHV in a school without a teaching certificate if you have completed the first two courses of the Standard Diploma Course. To teach SSEHV in a community organization, you need to complete at least Course 1 of the Standard Diploma Course. Once you complete all the requirements for the Standard Diploma Course you will have the knowledge to initiate a SSEHV Program in the community at large. 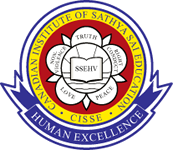 Note: All such Programs must be approved and registered with CISSE (Canadian Institute of Sathya Sai Education). Kindly contact the Director if you wish to take this initiative. Q. Does completion of the SSEHV Diploma Course in Canada allow me to teach SSEHV in a school or community program in other countries? A. As a general rule, you may be able to, but the approval of the host country will be required. Q. Our school information on your website is out-dated or incorrect. How can this be corrected? A. Please email webmaster@cisse.ca to update the information or make corrections. Q. When is this institute scheduled to start its activities? A. Most activities are already in place. Please see the CALENDAR. Information on additional/new activities will be posted when available in the NEWS section and the CALENDAR. Q. Will there be separate training courses for parents? A. Yes. Please see section DYNAMIC PARENTING and the CALENDAR.